Risotto is a warm and satisfying dish. You’ll love the creamy texture of this recipe, especially when mixed with vegetables and toasted walnuts. A bowl of warm and creamy risotto can truly hit the spot. 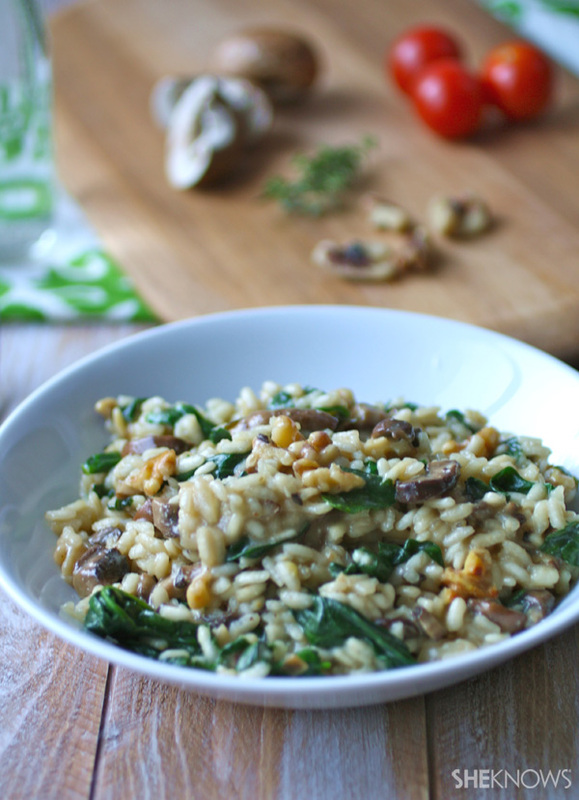 This recipe for vegan spinach and mushroom risotto with toasted walnuts combines textures and flavors for a welcome meal. You’ll need to stand near the stove for this recipe, but the result is worth it! The trick with making creamy risotto is to add the liquid portion in increments. After adding about 1/3 of the liquid, you stir and wait until it’s absorbed before adding more liquid. You’ll do that two more times to reach optimal creaminess. Another nice thing about this dish is that’s it a little healthier as a vegan option. I added a vegan buttery spread and vegan Parmesan-style cheese (although not much) to the mix. I love adding toasted walnuts, too. They make a nice contrast to the soft texture of this risotto. Add the olive oil to a large pan over medium-low heat. When hot, add the onion and cook until it’s translucent, about 4-6 minutes. Add the garlic and cook for a minute or so, taking care not to burn it. Add the mushrooms and thyme to the pan, stir, and cook until the mushrooms soften. Add the rice to the pan and mix it with the other ingredients to coat it. Cook it for about 2 minutes, stirring. You should hear the rice sizzle a bit. Add the wine. Cook, stirring, until the liquid is absorbed. Divide the vegetable broth in thirds. Add the first portion to the pan. Cook, stirring, until the liquid is absorbed. Do this two more times with the remaining broth. This should take 15-20 minutes. The rice should be soft at this point. Just before the last batch of broth is completely absorbed, add the buttery spread and Parmesan-style cheese. Mix well. Turn off the heat and add the spinach to the pan. 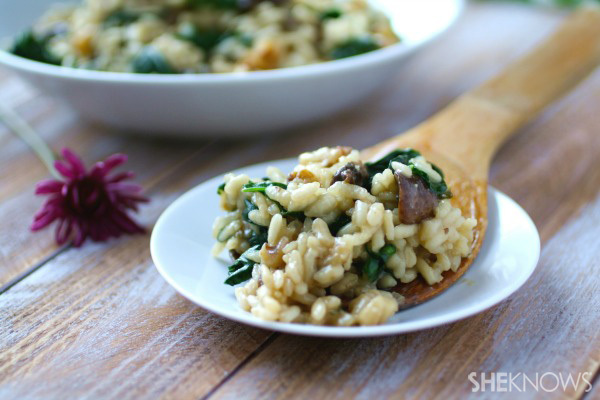 Stir the spinach into the risotto. The heat will wilt the spinach. Add the salt and pepper, and toss in the toasted walnuts. Mix well. 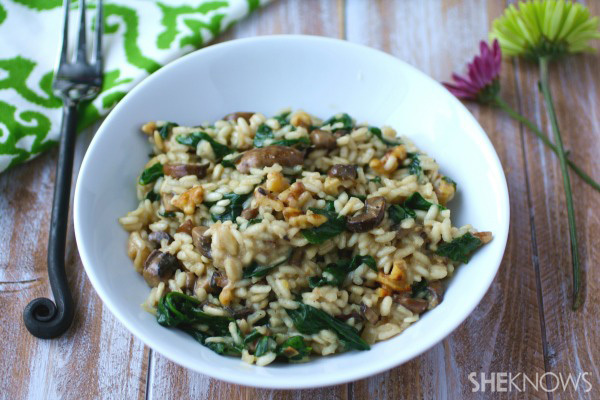 Warm up with this risotto dish!